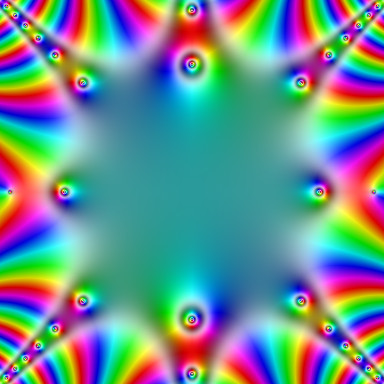 Complex Domain Coloring was introduced to me by Jan Hlavacek as a way of visualizing a function of a complex variable by associating a complex number with a color. The basic idea is to express the color in its HSV representation, where the phase of the complex number determines the color's hue, and the modulus of the complex number gives the color's saturation and value. 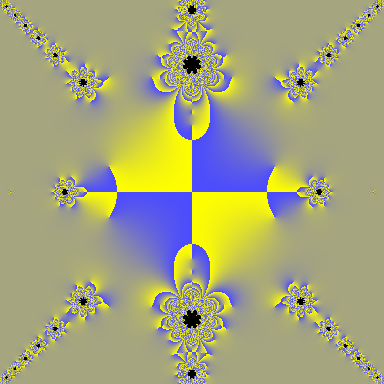 To facilitate the creation of such images, I wrote a S-Lang script called fztopng that converts a user-specified function of a complex number to a PNG image. For information about obtaining fztopng and more details about its use, see its page. 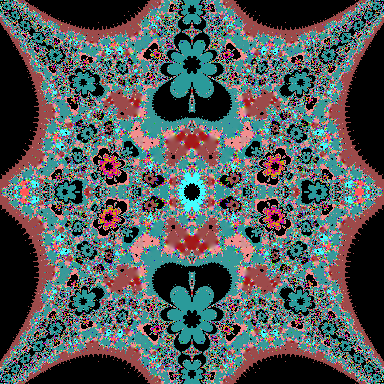 And the 10th iteration of f(z) resembles an Oriental rug: Now whenever I see such rugs I wonder if there is some complex function that will produce such a pattern!